You can trust our leg guards in ultra-robust PVC PROTEK. 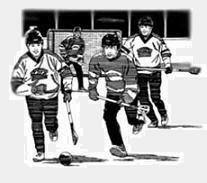 Typically used for ball hockey or softball, but some broomball players still prefer a hard plastic outer cover. PROTEK pads do not have very much padding, especially when compared to the D-Gel 555 Knee/Shin Pads. PROTEK knee pads and shin guards are moulded separately. Three elastic velcro bands for superior adjustment and durability. Foam / plastic protection for the calves for both indoor and outdoor games. Tested and approved by the CBHA and ISBHF. Color: Black. One pair of pads per order. Made in China. Greater bending range w/ two independent polyethylene knee and shin molds in polyethylene. 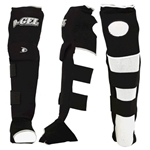 Fits any size leg with three straps (2 that are 360°) for quick adjustment and maximum adherence. 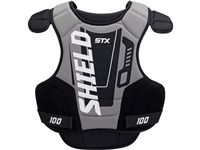 Back protector that fully covers the calf and offers full ankle protection. 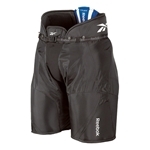 Ballistic nylon material between the knee and the shin for enhance thoughness. Color: Black or Red. One pair of pads per order. Made in China.